Apple Inc, YouTube, Facebook Inc and Spotify all took down podcasts and channels from U.S. conspiracy theorist Alex Jones, saying on Monday that the Infowars author had broken community standards. Infowars editor-at-large Paul Joseph Watson said in a tweet that the broad takedowns amounted to censorship and were intended to help Democrats in the national election this fall. "Infowars is widely credited with having played a key role in electing Donald Trump. By banning Infowars, big tech is engaging in election meddling just three months before crucial mid-terms," Watson wrote on the Infowars website. Neither Jones nor a representative for Infowars was available for additional comment, but Jones did comment about the decision on Twitter. "We've been banned completely on Facebook, Apple and Spotify," he wrote. "What conservative news outlet will be next?" The Infowars app remained available on the app stores hosted by Apple and Alphabet's Google Play, however, while Twitter Inc said that Infowars accounts were not currently in violation of its rules. The Alex Jones Channel on Alphabet Inc's YouTube on Monday displayed a banner saying the account had been terminated for violating community guidelines. A spokesperson added by email that repeated violation of policies such as those prohibiting hate speech and harassment led to termination of accounts. Apple deleted most Infowars podcasts and a spokesperson said in a statement that the company "does not tolerate hate speech" and that it publishes guidelines developers and publishers must follow. Only one program provided by Infowars, RealNews with David Knight, remained on Apple's podcasts platforms on Monday. BuzzFeed earlier reported that Apple had removed the library for five of Jones's six Infowars podcasts, including the shows War Room and the daily The Alex Jones Show. A representative of Spotify said that it takes reports of hate content seriously. 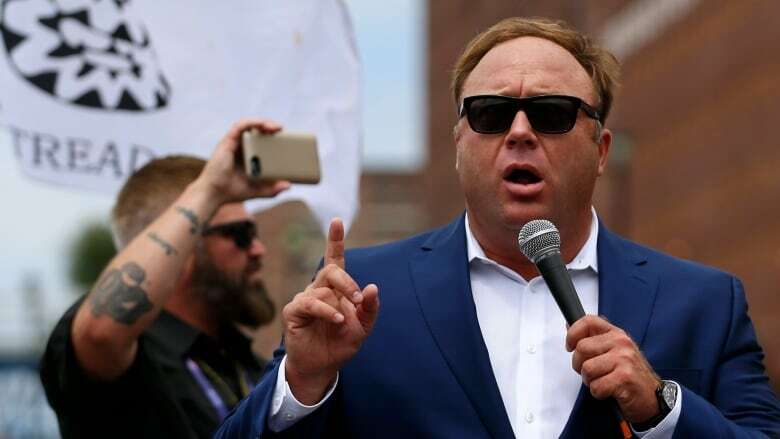 "Due to repeated violations of Spotify's prohibited content policies, The Alex Jones Show has lost access to the Spotify platform," the representative said. He is being sued in Texas by two Sandy Hook parents, seeking at least $1 million US, claiming that they have been the subject of harassment driven by his programs.